we are thrilled to bring you our eclectic two print collection in collaboration with wee gallery. it is available in two gorgeous monochromatic prints - kinship and faces in the stars. kinship is a fun mix of various animals found in nature. 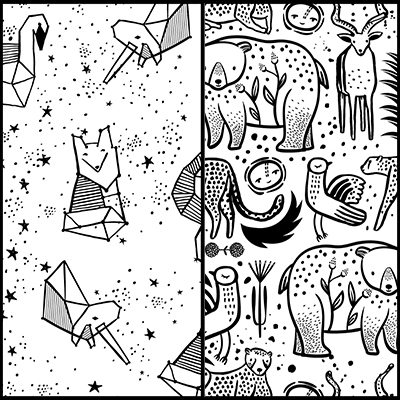 faces in the stars is a magical geometric print featuring mythical unicorns, swans, and foxes. both colorways come on our signature super-soft organic cotton/bamboo blend - optimally designed for baby's comfort. a beautiful hand-wrapped box that converts into a clever mini-dresser to hold all of your goumi essentials. inside it has two drawers, extends to hang up, and includes a cubby for important documents or treasures. goumi + wee gallery exclusive! a beautiful 40x30 super soft blankie with high contrast pattern. perfect for tummy time to help stimulate infant brain and eye development. our blankie also comes in an adorable bag made of the same soft material you know and love, complete with a nametag for the lucky little one.